Cooking, Cooking & Eating, Holidays, etc. We’re cutting it awfully close to the wire, here, for making a New Years themed blog post. But I wanted to share this one in particular before the calendar turned. 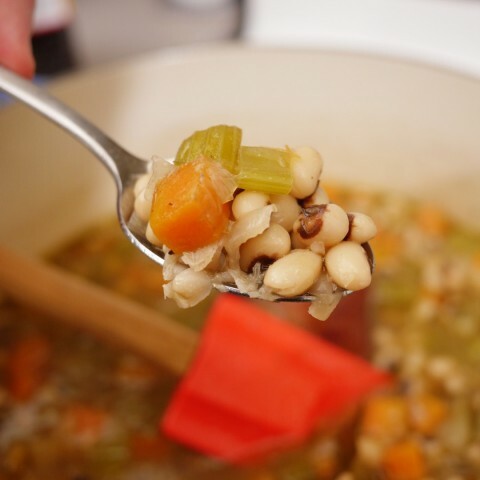 The thing with this recipe, and with black eyed peas in general, is that they’re good luck when eaten during that liminal space as we step from one year to the next. The thrust of the tradition is that they represent coins and prosperity. And that our eating them represents incoming cash. This is a tradition that — as far as I can tell — comes from the American South, and has been progressively worming its way into popular consciousness above the Mason-Dixon Line. I’ve always associated it with that most famous of all slavery-derived African American foodways, hoppin’ john, and with its cousins — peas and rice and gallo pinto — that are popular all over the Caribbean, and that have their roots in West African cuisine. It just made sense to me, I suppose, that folks might take a staple food — an everyday food — and give it some special meaning on days of celebration. Especially in times and places when there’s not a lot of money floating around for luxury ingredients, or anything like that. 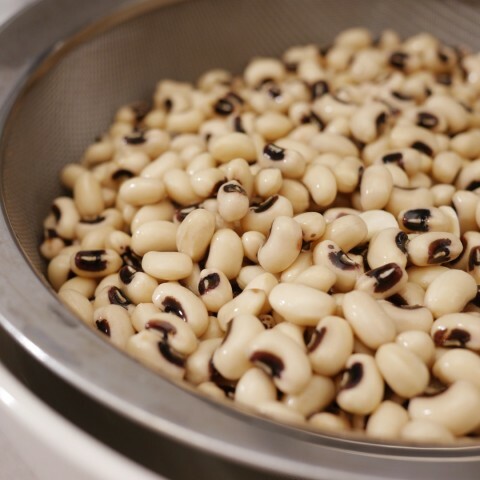 The fields of black-eyed peas were ignored as Sherman’s troops destroyed or stole other crops, thereby giving the humble, but nourishing, black-eyed pea an important role as a major food source for surviving Confederates. I like this explanation considerably less well than the other. It’s not that I begrudge the Confederates their nourishment, you understand. But it smacks of a kind of colonialism to me. It sounds a lot like a case of the privileged caste — white folks in the antebellum South — taking up an African American food tradition and claiming it as their own. And ignores the history of black eyed peas as a sign of racial and economic inequality. Which explanation is historically true? I couldn’t possibly say. But considering that it is a tradition in which I eagerly take part, I’m going to choose to believe the former. I’m going to choose to believe that my New Years meal is not a tribute to Confederate soldiers, fighting their lost cause and — as Jefferson Davis was so fond of saying — watering the fields of liberty with the blood of righteous men. And I’m going to choose to believe that the luck and prosperity that black eyed peas bring is not built on the backs of slaves. You can believe what you want. If you’re a spoilsport, you can even believe that black eyed peas bring no luck at all. But whatever you think, make them and eat them. They’re calendrically appropriate for the next few days. But they’re delicious all year round. The night before: pick through your black eyed peas to remove any sad looking ones, small stones, and bits of grocery-store crud. Then soak for a few hours (or overnight) in enough cold water to cover them by a couple of inches. The day of: Drain your peas, and allow them to sit in a sieve and drip. Heat a large saucepan or dutch oven over a medium flame. 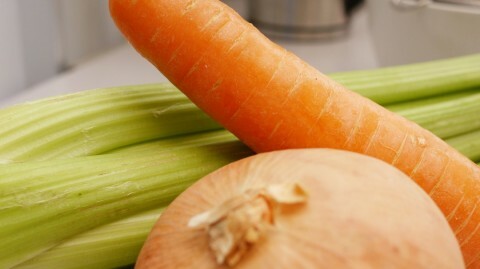 When it’s hot, add your carrot, onion, and celery with a little bit of salt, and saute until the onions begin to brown. Add the herbs and the ham hock, cook for about two more minutes, then pour in the peas, stock, and water. Bring to a low boil, stirring occasionally. Then turn your burner to low, and allow the peas to simmer until tender — about an hour and ten minutes. These peas can be eaten right away, straight out of the pot, and they will be delicious. 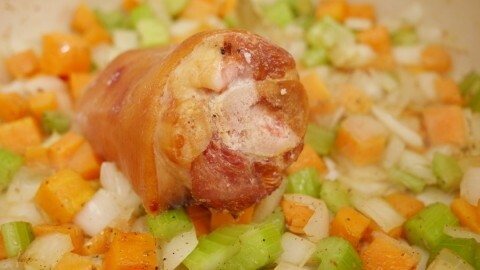 But they’ll be even better if you make then twenty-four hours ahead of time and reheat them in the oven. Have a lucky New Year!